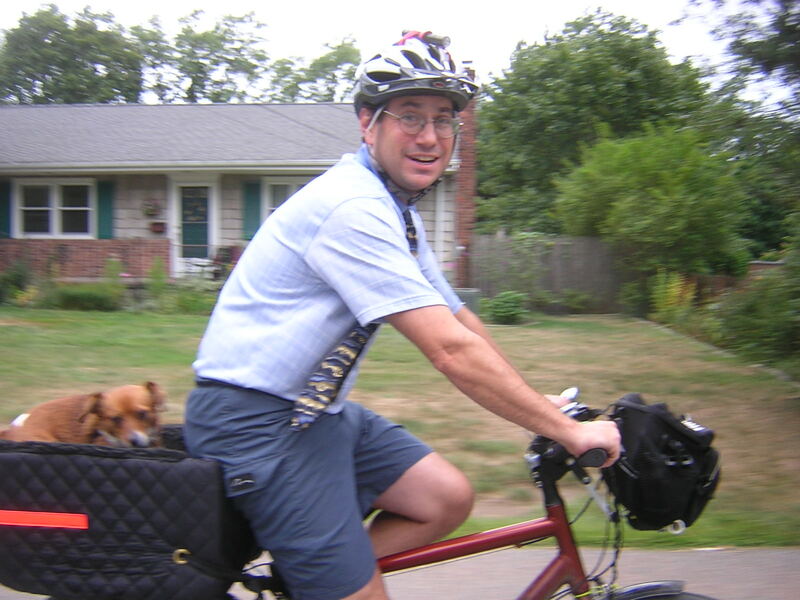 Ever since I got into bicycling after visiting Amsterdam I have always wanted an easy way to transport the dogs on the bikes as we travel to and fro ’round town. I have come up with some ideas and have had success riding with a dog in the past, but I only had one bike setup up at a time. Finally, in October 2009, 2 years after getting into biking, I have gotten both dogs riding on both bikes. 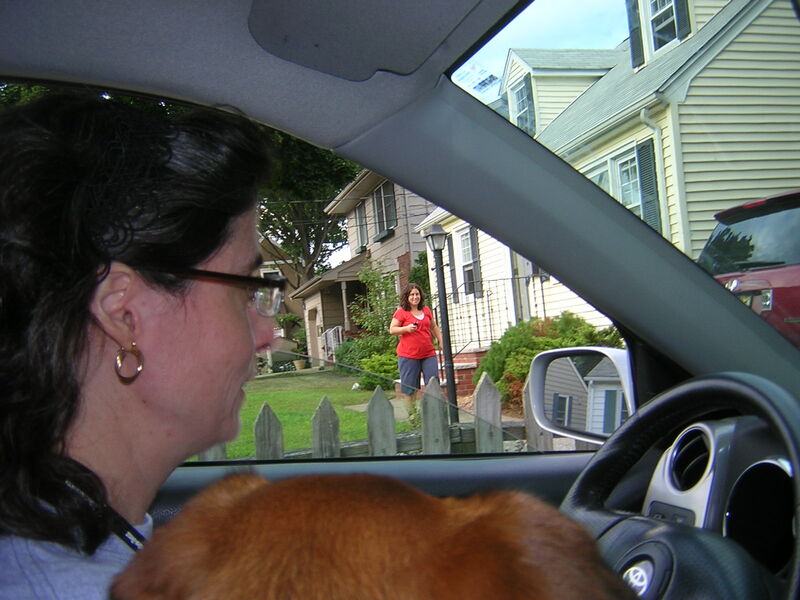 First we went to the 2009 Morristown Fall Festival with the 2-dog setup. This went really well. We were able to nicely walk through the crowded festival without too much Ragitude as I call it. On our way out of the festival Rags fell out of my crate as I lunged forward, but her harness held her in. I was just getting into the saddle when it happened, so we weren’t going fast when she was dangling by her harness and she didn’t get hurt. Nevertheless, it told me that I had to get a deeper carte or put some walls on the crate. I found the solution to the shallow crate problem in the back part of my basement. I used the headrests from my old Jetta, and the spokes from them secured nicely into the lattice of the crate. Solution found for 2 of 3 sides and it’s a big improvement in safety and comfort. In addition, it is light, stable, soft and easy to install. I just need to find one more for the third side. Our next trip was on Columbus Day when we took the dogs on a bike and hike to Dismal Harmony. That is a 5-mile bike ride each way and a beautiful hike through a classic Morris County type of trail. Fun stuff and I’m glad we can do it with the whole family. This time I had the headrests in place and the trip was a pleasure. The only real issue was Rags was barking the entire way there if Scraps was in her sights. It is just like when we kayak. Bark or no bark, we had a beautiful ride to Dismal Harmony where I video taped much of the ride and posted on the YouTube video below. It was kind of surprising that Rags was acting with such Ragitude this trip because we had both gone on 2 long bike rides in the previous few days alone with the new crate/headrest system. We did a 20 mile ride and a 13 mile ride with no problems so her barking was a bit of a bummer on the whole experience. We locked up the bikes and hiked for an hour and a half or so. Following along Dismal Harmony Brook allowing Scraps to prance up and down the rocks on the trail was lots of fun. Rags was on the 20 foot lead so she even got to explore a little. We shot a few pictures during the walk and then I continued shooting the video of the bike ride on the way home. This was a fun bike and hike with the dogs and I look forward to many more. Afterwards we brought Scraps to Agility class for some practice there. 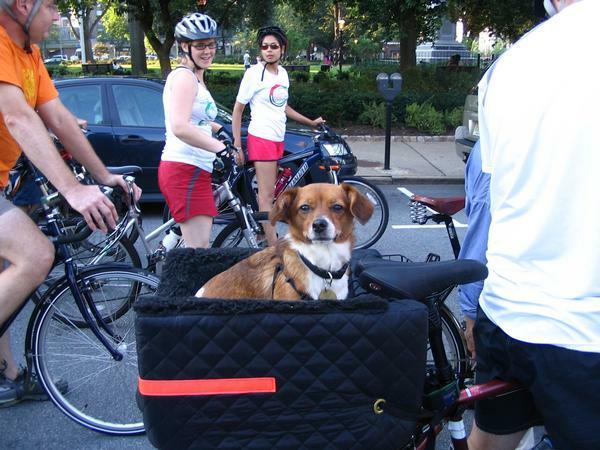 You can see our previous setup for biking with the dogs includes the large padded dog bed with built in restraint. This works well but it does cost $80, doesn’t work in the rain and it cuts of your ability to use panniers. Nevertheless, you can put it on and off pretty quickly and fits both bikes. We have been using this for the past 2 years I think. For a little while I had a large rectangular milk crate on the back of the bike and I was able to use the light weight Container Store draw to make a nice cage. This worked great for safety but the dogs couldn’t stick there heads out of it. In any case, I abandoned the milk crate, it was too big to keep on the bike forever. We used it for a while. With the winter coming we will see how many more dog trips we have but I am psyched we have solved this dilemma for now. I’ll be looking forward to the spring with lot of rides. I’ll try to keep you and me posted. It was the last Friday of the month and in Morristown, NJ for the past year that has meant a critical mass bicycle ride through the streets of Morristown. This month we took Rags with us in the cushy bike carrier as Kathy and I joined what must have been at least 200 other bikers in the ride. This was the one-year anniversary of this ride and is coincidentally just over the one-year anniversary of me riding to work on my bike. I feel connected to this ride as it has advanced along the same bike path as me. 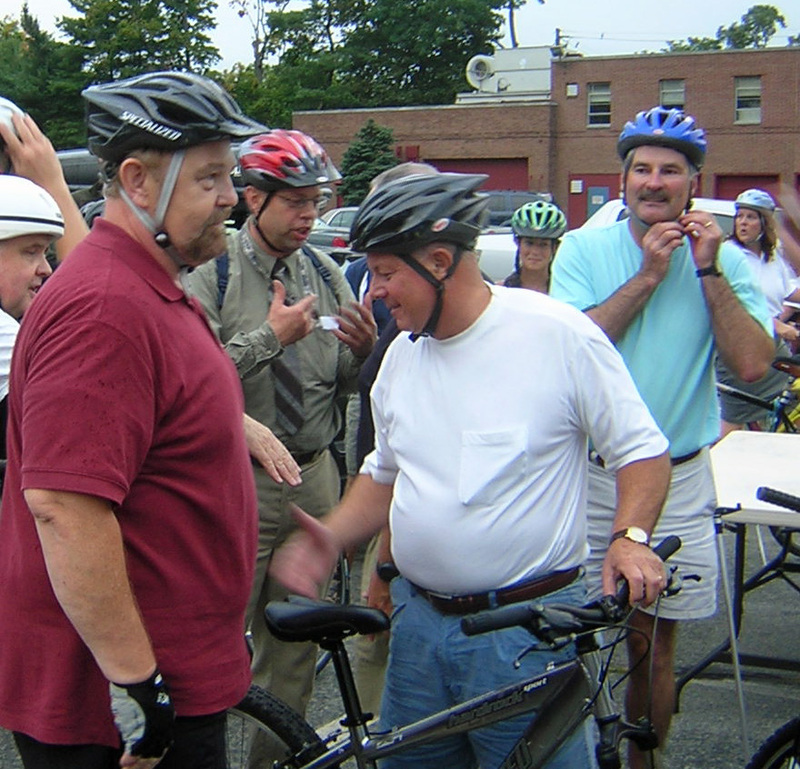 Mayors Nace, Cresitello and Hussa are just a few of the Morristown Mayors who biked in the critical mass bicycle ride. This was a giant ride including lots of dignitaries besides Rags. Morristown Mayor Cresitello rode in the ride along with Denville Mayor Hussa, Morris Township Mayor Nace, Parsippany Mayor Luther, Morris County Freeholder and Wharton Mayor Chedwiggen and I’m sure a few others I didn’t know about. We saw Rebecca Feldman who is a councilman of Morristown. The primary theme of the ride was biking to work so people were encouraged to wear suits and work clothing. I wore a tie around a golf shirt while Kathy wore a pink sports jacket. There’s probably a woman’s name for this type of sports jacket but I’m not sure what it would be. Marty was there, Paul Miller, Steve the Saturday morning bike rider who I had no recollection of was also there. There was “thay guy” and oh yeah, “that guy” and “we’ve seen that woman before.” Everyone seemed to be at this ride. I captured lots of it on video as I was hauling Rags around so enjoy it. Unfortunately, since Rags was behind me and I was recording the ride I got like no footage of Rags. You hear her barking a bit and people commenting about her. Along the ride Rags would bark if Kathy was riding ahead of me. Rags enjoyed looking behind me and seeing Kathy. We stopped for Pizza at Milanos on the way home. It was dripping rain a bit but not too badly. We ate the pizza outside in it and then rode home. Nice and quick through Morristown. Since you miss the dog dfor the most part on the bike ride video, below is a video compilation of Scraps and Rags playing ball and playing in the agility park at the Denville Dog Park the night before (August 28, 2008). For a little while Duke and Link the Dogs were there playing with them, but for the most part it was just Kathy, Scraps, Rags and a tennis ball. 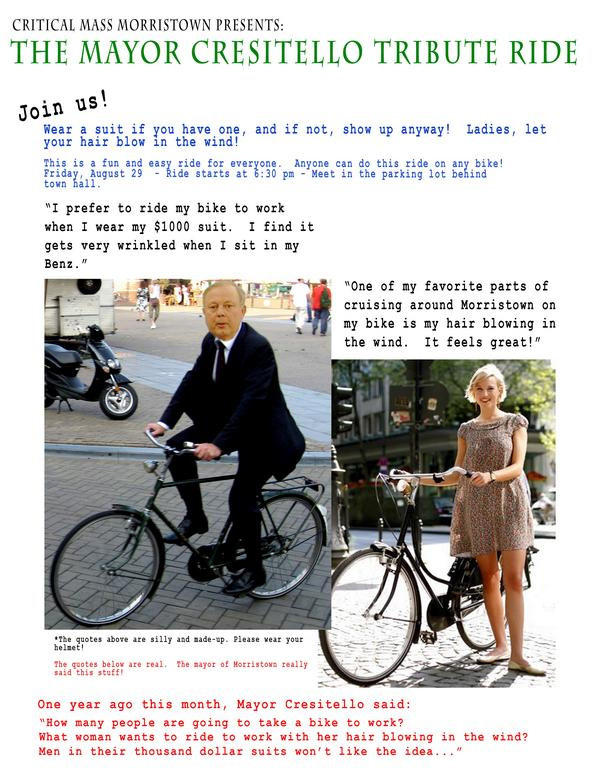 The unofficial, undergound poster for this critical mass ride. Rags barking at the neighbors prior to gogin to the dog park.